Often called the "Whiskey Route" this is a scenically beautiful trail, longer and much gentler than Umbwe or Marangu (the "Coca Cola Route"). 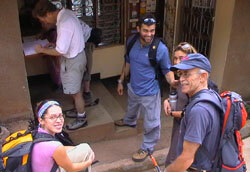 Our itinerary provides valuable acclimatisation by having extra, but shorter walking days during the trek. 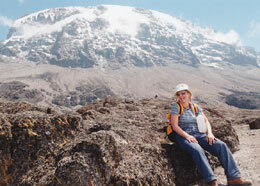 From Arusha, drive to the Machame Park gate, set off climbing gently through the south-western slopes of the mountain. This is original montane forest, carpeted with unique "busy lizzie" flowers, begonias and ferns. First camp amongst the giant heather at 3,000m. A 1,200m ascent and 6 hours walking. Emerging from the forest into the giant heather zone and out onto fine open moorland to camp by the Shira Cave at 3,840m. We've seen herds of eland up here and there are fascinating geological features in the old volcanic caldera which can be viewed during a half hour optional walk in the afternoon. 840m ascent and 4-5 hours walking. 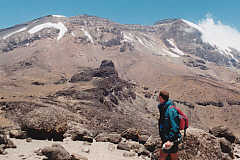 From Shira, climb towards the main peak Kibo, with the western glaciers clearly visible across the rugged high-altitude desert of volcanic rocks and boulders. Skirting around its base and under the imposing western Breach, descend into the sheltered Barranco Valley for mid-way camp at 3,950m. 5-7 hours walking and only 110m total ascent - but having climbed much higher and dropped back down assists acclimatisation. Up the steep Barranco wall with some sections of very easy scrambling and drop down again to the Karanga Valley. This is a short walking day, 3-4 hours, with an optional acclimatisation hike in afternoon up onto the scree below the glaciers. 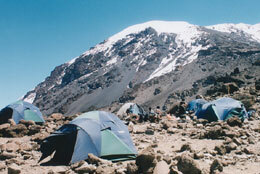 Up to a new camp about 150m above Barafu Hut perched high on a rocky bluff at 4,750m. Fantastic views across to Mawenzi peak, and a bit less to climb tomorrow morning! This is another short walking day, about 4 hours, with less exertion and a good rest in afternoon immediately before the hard summit day. 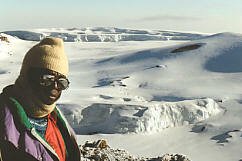 Every Kili itinerary needs the summit pic! A bracing 1am start to climb the steep frozen scree. This is unavoidable on any route but we aim to reach Stella Point on the crater rim for sunrise - another 40 mins and you're at the highest point on the continent, usually in warm sunshine. 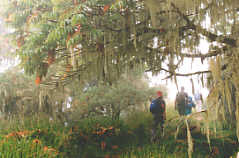 We return on the Mweka descent route. Walking time 7 hours and 1,300m ascent to the summit, 5-6 hours and 2,800m descent to our camp in a clearing amongst the giant heather at Mweka. This is a long and hard day - you'll feel tired but absolutely ecstatic after you've done it. A 4-5 hours descent through the forest to Mweka Gate to collect our certificates and meet our vehicle. Return to Arusha. Accommodation is camping throughout in 3 person mountain tents shared by 2 people. All your equipment will be carried by vehicles or local porters, you only carry a day-pack with personal gear. When camping you will not have to participate in camp chores. We buy fresh produce locally and to ensure good standards of hygiene all food is prepared by our own staff. We can cater for special dietary requirements and there are no extra food-kitty payments. 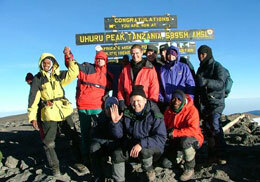 We can also arrange airport transfers and accommodation in Arusha for before and after your trek. US $2,295 per person if you can join one of our scheduled departures - see When we go. We need a minimum of 2 people booked for these trips to run. Contact us for booking status if you are a single traveller. 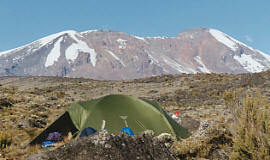 This price includes all Kilimanjaro entry, camp and rescue fees.